There are two things I love in life: food and itineraries. Seriously. I make itineraries for any occasion and sometimes just for a rainy day. I love being organized and having a plan. Knowing this, one of my friends sent me to Pepperplate.com to check out their new website and iPad app (disclaimer: I am not cool and don't have an iPad, so this is strictly about the online experience). This site is like an OCD foodie's dream; I subscribe to roughly four food-related newsletters and have an email folder for all the recipes. Long I've thought about a better way to organize this, because searching through 1,000+ emails for a recipe isn't exactly effective. 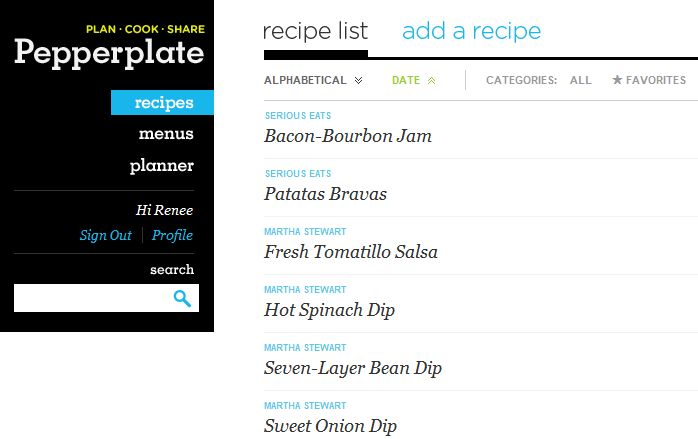 Pepperplate allows you to take the URLs of your favorite recipes from sites such as Serious Eats, Bon Appétit, Epicurious, Food Network, Martha Stewart, etc. 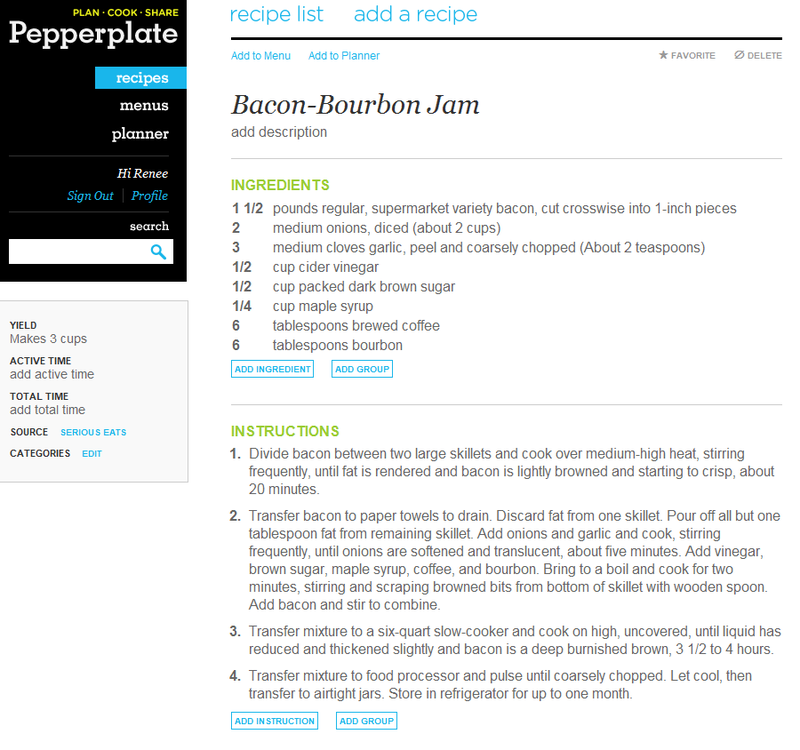 and upload the recipes in an instant to your profile. So now I can take my favorite recipes from my newsletters and have them all in one place without having to sort and click-through all the emails. Awesome. 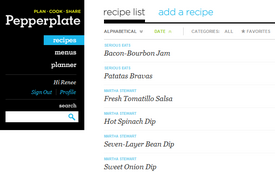 Once you have the recipes you want uploaded you can then click on the menu tab and create different menus. After you've created a menu, you can add the recipes from your recipe list to the menu you've just created and eventually upload to your planner. While, it's not the most intuitive process, after about a minute of playing around you understand the process. Then the planner. So you've uploaded your recipes, added them to your menus and merged with your planner. You can now click on your menus and see the recipes you assigned there. Once you know what you are cooking you can go back to the recipes section, find your recipe and start cooking -- all the ingredients and directions are there! If you have an iPad this would be great for the kitchen. I have a cookbook stand, but I find myself dragging my laptop in to the read the recipes while I cook. Pepperplate is still in the early stages so there are still some things I would like to see moving forward, like being able to share your recipes, menus and planners with friends, more recipe sites, more hyperlinking within the site for a more fluid user experience and possibly the ability to sync with things like my Outlook and Google calendars. If you have the iPad and love to cook this app is a must. If not, you can sign up online and start organizing. You might also try BigOven (see a demo on BigOven.com). Search 200,000+ recipes and add your own by url - plus use the calendar-based menu planner, grocery list, nutrition info and more. Get the free BigOven apps for iPhone, iPad, Android, Kindle Fire and Windows Phone, or use BigOven on the web - everything automatically syncs. How do I delete a recipie from the favorite list?